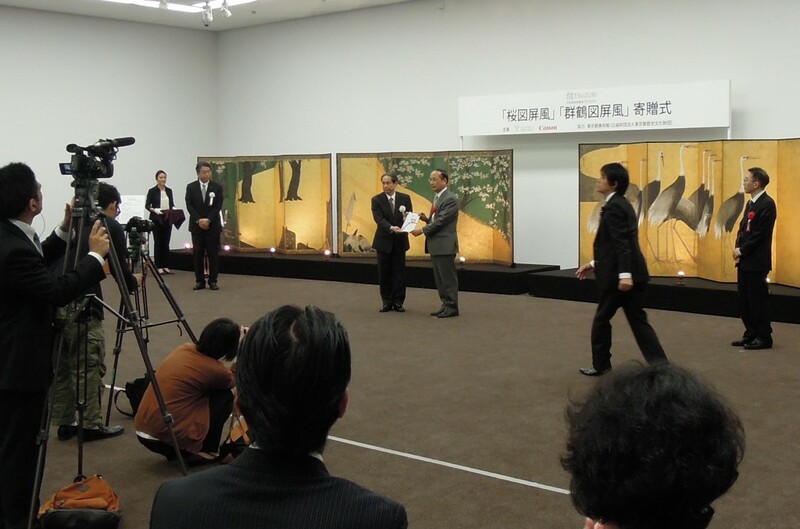 The 5th Art Donation Ceremony of the “Tsuzuri Project” (Cultural Heritage Inheritance Project) was held. 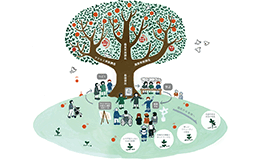 The “Tsuzuri Project” is a social contribution activity that the Kyoto Culture Association and Canon Inc. promote together. 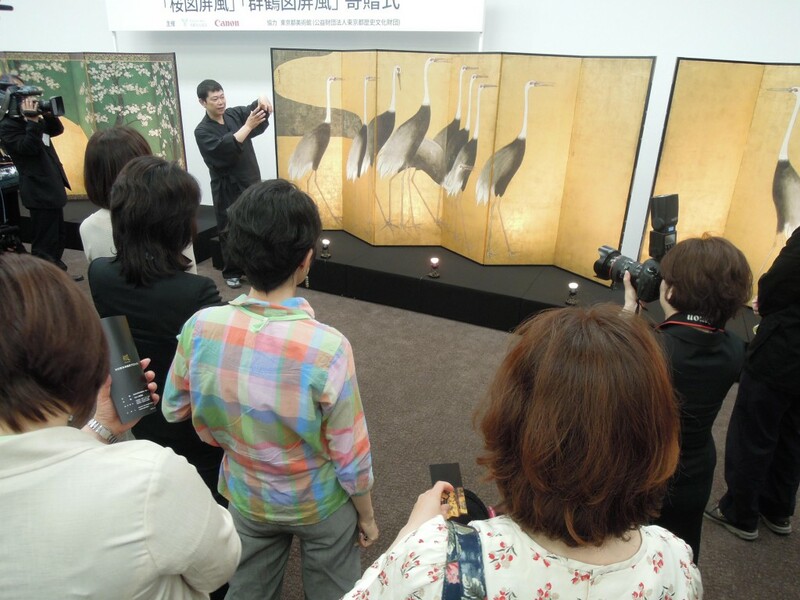 This time, a pair of high-definition replicas of 6 panel folding screens was donated to the Tokyo Metropolitan Museum. They are high-definition copies of the Sakura-zu Byobu, meaning “cherry blossom design folding screen” (by Sotaro Tawaraya, one of the collection of the Freer Gallery of Art, Smithsonian Institution, Washington, DC) and Gunkaku-zu Byobu, meaning “flock of cranes design folding screen” (by Kourin Ogata, also the collection of the Freer Gallery of Art, Smithsonian Institution, Washington, DC). The two reproduction pairs of the folding screens were closely comparable to the original and done so beautifully from the fusion of the advanced digital technology of Canon and the artisanship of Kyoto’s traditional crafts history. 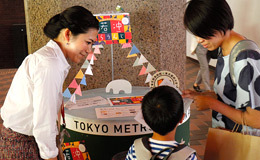 In the future, we plan to use the donated folding screens centering on art communication projects at places such as practical art viewing education and various workshops. Many TOBIRA candidates (hereafter: TOBIKOs) also joined the Memorial Ceremony, and took a long and hard look at the folding screens after the Donation Ceremony. One advantage of having a reproduced copy is being able to view them this closely without the need to place them inside a glass case. 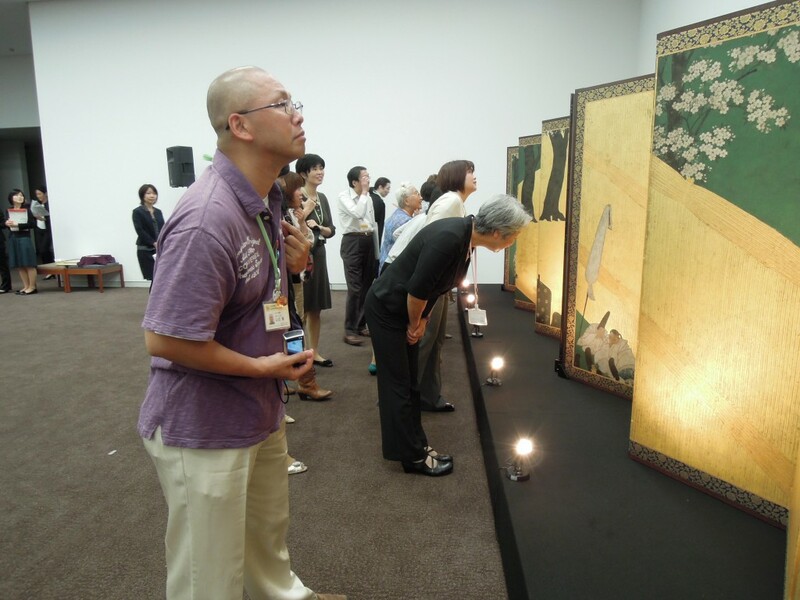 While keeping the original pieces stored in an environment to prevent degradation, realistically experiencing the pieces’ appeal is the beauty of a high definition copy and the concept of the Tsuzuri Project (Cultural Heritage Inheritance Project). It is possible for people with weak vision to view the screens up close and experience the folding screen’s light in a regular daily living space. It seemed that the TOBIKOs were seriously pondering how to utilize the pair of donated screens in the future while viewing them. 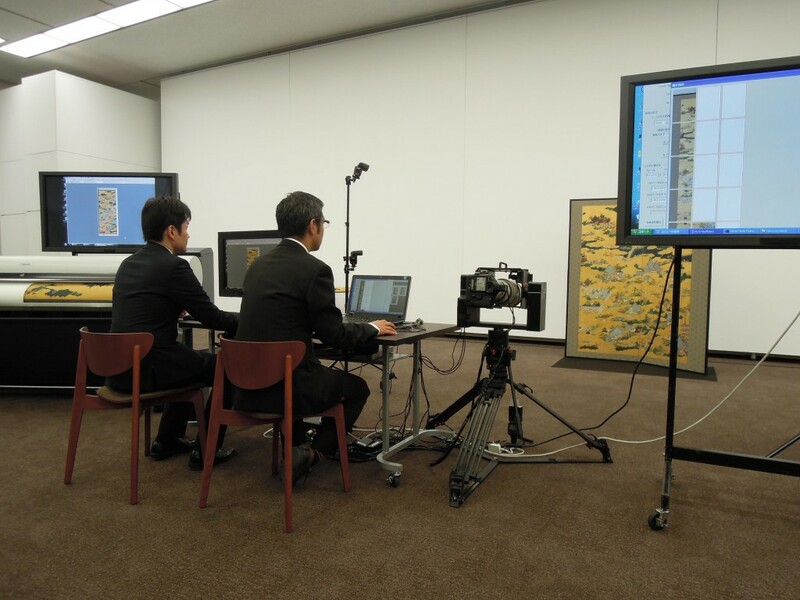 In the exhibition hall, there was also an exhibit regarding the technology used in creating the high-definition copies in addition to the donated pieces. The TOBIKOs got to see a demonstration of high-resolution photography and color output technology by printing out the same exact color as the copied object using Canon’s camera and printer. 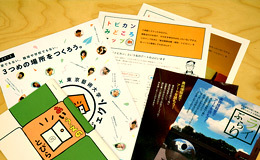 The paper used for the printout was researched to make sure that the inkjet printer’s color representations will come out while still keeping the impression of the Japanese-style paper used in the folding screens. I could see their thorough dedication. 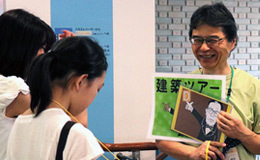 Next, there was a demonstration on how they placed real gold leaf on the picture that was printed out. 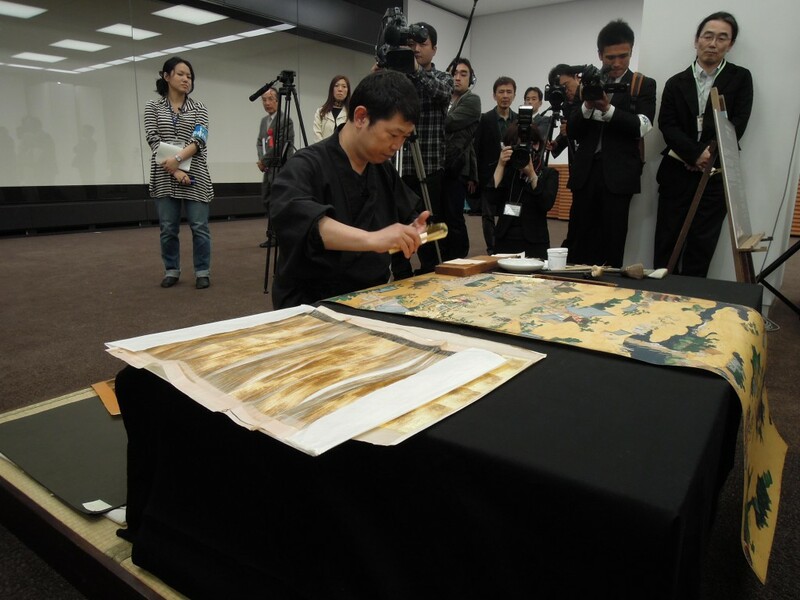 Making brand new gold leaf look like it has been aged over the years is a technique that can only come from a seasoned and skilled artisan and is therefore brought out in the reproduction. It was truly a moment of collaboration between cutting-edge technology and craftsmanship that has been passed on from generation to generation.